Pine Meadow Golf Club in Mundelein just north of Chicago is owned and operated by the Jemsek family, who also have the 4 courses at Cog Hill ( annual site of the Western Open) and the two at St Andrews in their fold. Both Pine Meadows and Dubsdread at Cog Hill have been selected in the top 25 public courses in the country by a wide range of golf publications. At any of the three facilities in Suburban Chicago, golfers can expect top notch conditioning and quality service, that has become a standard with the Jemsek name. At Pine Meadow, the beautifully manicured bent grass tees, fairways and greens are complimented by outstanding landscaping, with flower beds and shrubbery near the tee boxes and greenside. 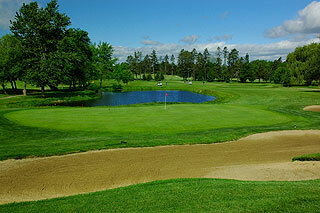 This course has been awarded 4 stars by Golf Digest Places to Play for a number of years. When it opened in 1986, it was honored as the Best New Public Course in America by Golf Digest. 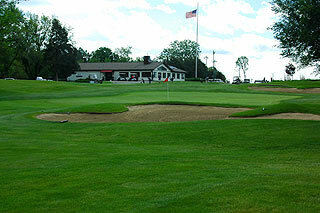 The clubhouse at Pine Meadow includes a pro shop plus restaurant and lounge, situated adjacent to a spacious putting green. Banquet and outing facilities can easily accommodate upwards of 250 people, and the restrooms for men and women include changing areas with showers. Besides the putting green, practice facilities consist of a driving range with grass and mat tee stations, plus a short game area with sand bunker. As with all the Jemsek owned golf facilities, which support the traditional values of the game, walking is permitted anytime on this course. Uniquely, small color coded flags situated in the fairways indicate the 100,150 and 200 yard areas, and markings for these yardages are also provided for on the cart paths. Each tee area provides a yardage block that is color coded to match the measurements on the scorecards, and red, white and blue flags let golfers know if the pin is located in the front, middle or back portion of the large and mildly undulating greens - simple system, and it works. Five sets of tees afford all levels of players the opportunity to choose a distance that fits their game. The Tournament tees measure 7141 yards while playing to a challenging but fair 138 slope. Alternate sets measure 6877/135 slope, 6450/131 slope, 6152/126 slope and 5203 yards with a slope of 112. The front three tees slope out at 139, 136 and 125 for women. As you can see, the distances are interspersed quite evenly - with the white tees the recommended choice for average players. The abundance of tree lined fairways, with 75 bunkers, 6 water hazards and natural areas on this Joe Lee design will challenge all golfers to beat their handicap. The opening hole is a relaxing one, a mid range dogleg right par four, with the 150-100 yard zone left of center the most advantageous positioning from which to approach the green. Number two is a snaking par five that turns right then left, with rows of bunkers along the right that really should not come into play. The approach on this # 1 handicapped hole is uphill. Three doglegs to the left with water coming into play on that side about 225 yards away. The bunkers on either side of the putting surface are quite deep. Four presents a generous fairway, with plenty of room until the 40 yard area, which is saturated with sand traps on both sides. Up and downs will be difficult from any of these traps. The par fifth plays over a marsh with plenty of room greenside, and precedes a long par four with an opening in front of the putting surface that encourages a low running approach. Anywhere left of the cart path is good off the tee on seven, which doglegs right to a ridged green that is well protected by a triumvirate of sand bunkers. 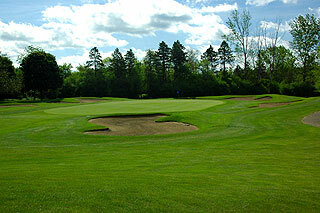 The eighth is a pretty par three with understated ridges on either side, and deep bunkers short right and left. The wide fairway on the par four ninth turns to the left near the 130 yard area with the green tucked in between bunkers on the right and trees left. 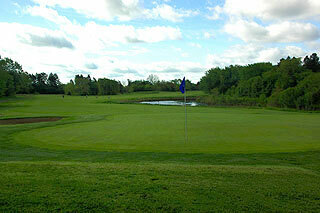 The back side is a bit shorter than the front, and presents some good scoring opportunities on the first three holes. 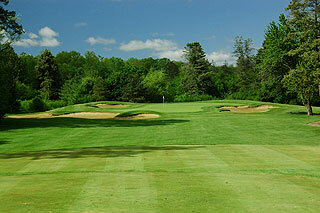 Numbers 10 and 11 are mid-range par four doglegs, with 10 bending to the left and 11 turning in the opposite direction. Both have ample fairways that are best played to the middle. Sculpted bunkers define the putting complex on the par three 12th, which has a ridge running across the center of the green - pretty golf hole. 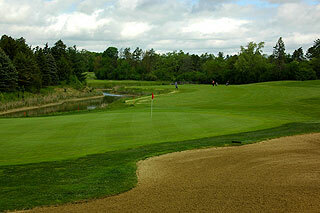 In fact the stretch of holes from 12 - 18 is unquestionably the best of the layout, providing a memorable finish. The water hazard on the left comes into play about 270 away, and can be easily reached by long hitters. This hazard also cuts across the fairway near the 210 yard area. The left center is the place to be for the approach. Fourteen doglegs to the right with water in play all along the side. From 150 to 100 yards in, golfers will have a clear shot at the green, which is tightly situated between the hazard to the right and bunkers short and long left. As this photo indicates, this is a uniquely beautiful golf hole. Another gorgeous view awaits from the 15th tee. The initial shot on this beautiful par five must carry a hazard to a wide fairway that bends right to left. The right center is the best area fro\\or an approach to a putting complex that features intricately designed bunkers on either side. The par four 16th turns 45 degrees to the left near the 100 yard zone. The raised green is closely guarded by a humungous sand trap in front. If the pin location is on the right side, the 17th is a tough par three. If in the center or left, this hole is much more playable and is deserving of the 18th handicap. 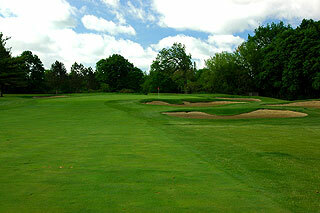 The finishing hole is a long dogleg right par four, which is tough to cut as the tree line extends to the 150 area. The approach is a beauty - over water with bunkers deep of the putting surface and the clubhouse in the background. Pine Meadow Golf Club has a lot of character, and with consistently high slope ratings from the first 4 sets of tees, it takes some character to play it. It is the type of layout that one will want to play again and again. The course has been thoughtfully designed to challenge all levels of skill, while providing a playable experience from the forward tees. We recommend it highly! 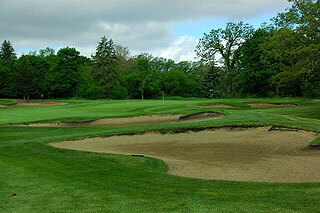 For more info on Pine Meadow, visit our page on our Chicago golf course listing section by clicking here.